I recently did a photo shoot for a cheese manufacturer. 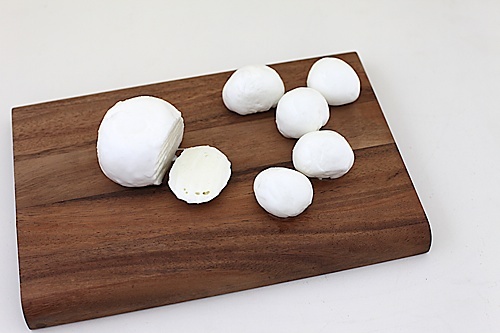 Mozzarella, mascarpone, cream cheese, ricotta, buffalo mozzarella & bocconcini were my beautiful subjects for the day. Needless to say, I cooked a lot with cheese the following week after the shoot. Our favourite Caprese salad made with fresh organic bocconcini, grilled sandwiches, au gratins, a surprise cheesecake (coming shortly!) and this lovely salad made with eggplants and bellpeppers with my favourite salad dressing ingredient, pomegranate molasses. My experience has been that this magic potion can perk up any salad! I really don’t care much about raw salads as opposed to my better half who loves raw vegetables and salads! At exactly, two years and two months old, it is not yet clear what the preferences of the other inhabitant of our home are and how his food preferences would be is a matter of great curiosity to me at this point in time. Since I’m fond of cooked vegetables in any form, be they poached, grilled, steamed or baked, I decided to grill some eggplants and bell peppers and assemble it with slices of bocconcini cheese and dress it up with a moderately spiced, sour and slightly sweet dressing with pomegranate molasses. If you can’t easily find fresh bocconcini or don’t have pomegranate molasses on hand, don’t fret! 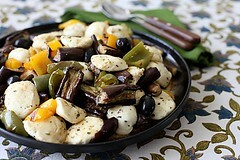 You could easily substitute bocconcini with paneer cheese and pomegranate molasses with balsamic vinegar or lime juice. This makes a substantial meal by itself but you could pair it with a simple pasta, bread and soup if you want and you would have a perfect spread! Place the eggplants in a colander placed over a bowl, sprinkle them with 1 tsp salt and allow the bitter juices to drain, about 15 to 20 minutes. If you are certain that your eggplants are not bitter then you could skip this step. 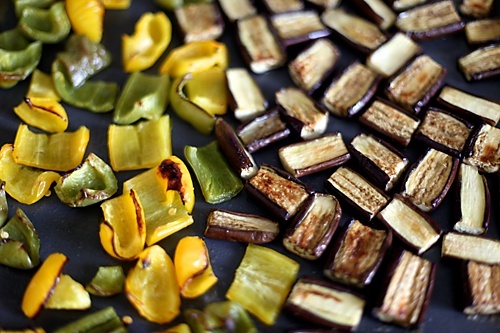 In a bowl or on a baking tray, assemble the bell peppers and eggplants and toss with 1/2 tsp salt and 2 tsp olive oil, arrange properly on the tray and grill in the oven for about 15 to 20 minutes at 200 degrees centigrade/400 F/Gas mark 6. In a small bowl, assemble all the dressing ingredients and beat with a spoon or whisk until smooth. 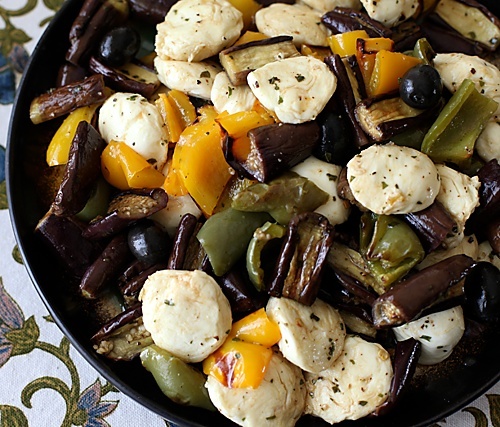 In a medium sized bowl, assemble the grilled vegetables, cheese, olives and dressing and toss until well mixed. 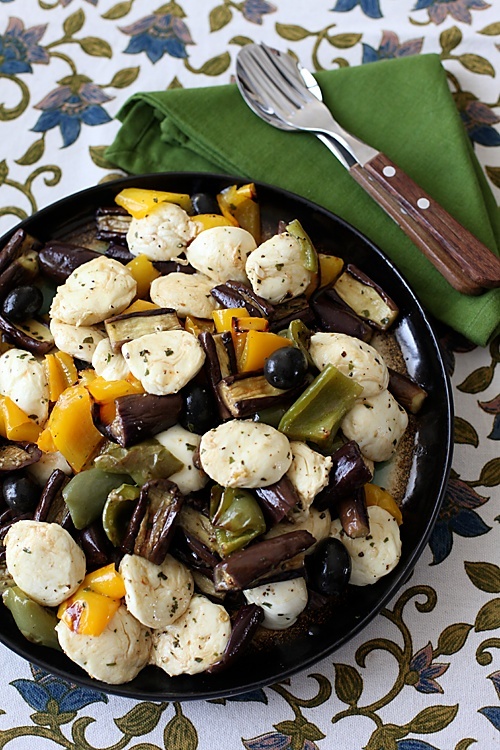 Love grilled veggies and if an exotic cheesy element is added to it…heavenly treat! 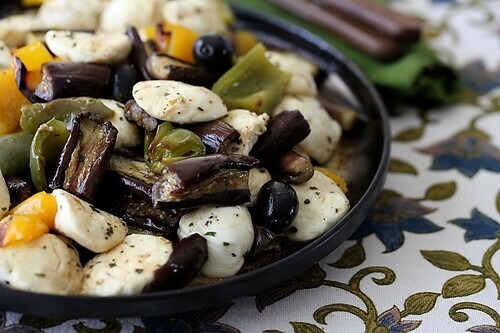 Need to try grilled eggplant, the most neglected veggie by my kids 🙂 Hope I get this variety of cheese – bocconcini in Chennai too. Fantastic! Super shoot and needless to say that since I'm one of the lucky ones to have tasted it, I would rather refrain from commenting here! Reason is very simple. I'm kinda currently lost in savouring the brilliant taste of this super brilliant creation! :-)) Too pre occupied to even comment!! THAT IS A REFRESHING AND HEALTHY SPRING SALAD! @Sanjeeta: I know many adults who have an aversion to eggplant….this is more in kids though! I myself used to hate eggplants as a kid, but like them now! I love bocconcini! The salad sounds lovely with the pomegranate molasses. Just in time for spring. It looks wonderful! Devi: I got this cheese from a cheese making company, since I was doing a shoot for their website. Unfortunately all these companies sell directly to 5 star hotels and A grade restaurants and don't sell it directly in the retail market. Things should change soon though. Britannia does make a cream cheese, though not as good as Philadelphia and laden with preservatives it is easily available at a decent price. Thanks for the info. Love your recipes and your photographs! Oh! Good cheese in bbay? Where do I get my hands on non-exorbitantly priced cheese?